Welcome back to FanDuel Picks Week 13, your one-stop shop for the best daily fantasy football advice. Another week, another money grab. 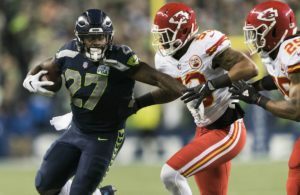 Again, we nailed the cheap QB (Russel Wilson and Lamar Jackson both put up 22+ FanDuel points) and tight end (Cameron Brate scored a touchdown, obviously) strategy, which helped save room for two high priced running backs (Melvin Gordon and Nick Chubb, who scored 19.60 and 26.30 points, respectively). The three wideout suggestions all scored 16+ FanDuel points as well, and the bargain bin play of the week, Josh Adams, chipped in with 16+ and a touchdown as well. Just in time for Christmas spending money too! Luckily for all of you I am just coming out of my Thanksgiving turkey coma, right in time for some Week 13 FanDuel picks. As a note, these picks are based on Sunday only leagues, so players on Thursday, Sunday night, and Monday night will be ignored. Jared Goff, QB, Los Angeles Rams ($8,400) – Even if ever so slightly impaired by his ankle injury, the Rams could give Todd Gurley some much needed R&R Week 13 as 10 points road favorites in Detroit. So expect Jared Goff to shoulder much of the offensive firepower this Sunday. Goff dazzled in the Monday Night Football showdown 2 weeks ago against the Chiefs, throwing for over 400 yards and 4 scores. He now has multiple touchdown passes in 5 straight games (14 TDs:1 INT), and has gone for 20+ FanDuel points in 4 straight. Chase Daniel just completed 73% of his passes and threw for 2 touchdowns against the Lions, so Goff could light them up like a Christmas tree. Lamar Jackson, QB, Baltimore Ravens ($7,500) – Lamar Jackson continues to impress early in his rookie campaign for the Ravens, improving to 2-0. Sure, the 58.4 QB rating and underwhelming passing offense is somewhat concerning, but he has totaled 190 rushing yards on 37 carries for 1 TD in his two starts. On Sunday, Baltimore travels to the fast track in the Georgia Dome to face a Falcons defense allowing the second most fantasy points to opposing quarterbacks. While most of the damage has been done through the air against Atlanta (they have allowed 3+ passing touchdowns in a whopping 7 games this year), they have allowed 3 rushing scores to opposing quarterbacks. This could be the week Jackson puts it all together against a poor defense. Kareem Hunt, RB, Kansas City Chiefs ($8,900) – Projected as a 15 point favorite Sunday (the highest of any team), a positive game script is once again in the cards for all-world running back Kareem Hunt. 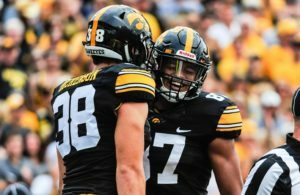 Hunt’s usage has dipped a bit the past three weeks, not receiving 20 touches in any of those games, but his scoring pace remains torrid with 4 scores during that stretch. The Raiders allow the most rushing yards per game, and rank in the bottom third in the league in terms of touchdowns allowed on the ground and yards per carry. Christian McCaffrey, RB, Carolina Panthers ($8,800) – Not much else to say about Christian McCaffrey except “Wow”. His versatility in all facets of the game was on full display last week against Seattle where he totaled 237 yards on 28 touches (17 carries and 11 receptions) for 2 touchdowns (1 rushing and 1 receiving). McCaffrey has scored 2 or more times in 4 of his past 5 games, and should remain the focal point of the Panthers offensive attack against Tampa’s league worst defense in a game with the second highest projected total (55.5). 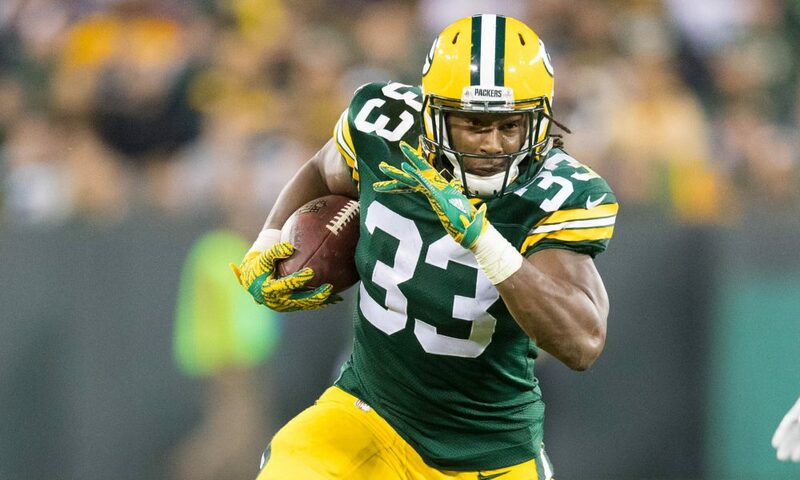 Aaron Jones, RB, Green Bay Packers ($7,600) – Projecting as 14 point home favorites against an inept Arizona offense, the Green Bay Packers will likely avoid throwing against Arizona’s stellar secondary and use the ground game against a Cardinals defense that has allowed the most rushing touchdowns, the third most rushing yards per game, and the third most fantasy points to opposing backs. Since Mike McCarthy woke up from his season long slumber Week 8, in those five games since Aaron Jones has scored 6 touchdowns, rushed for 84 yards per game, and totaled 108 yards per game. When Jones gets the work, he produces, and that should be the case Week 13. LeSean McCoy, RB, Buffalo Bills ($5,700) – No comprendo this FanDuel pricing. LeSean McCoy might play for a historically bad Bills offense, but still commands a high volume with rookie Josh Allen under center. Over the past two weeks, McCoy has garnered 43 carries and 45 overall touches while scoring two touchdowns and eclipsing 100 rushing yards once during that timeframe. The Dolphins allow the fourth most rushing yards per game and fifth most fantasy points to opposing running backs, so look for McCoy to receive 20+ touches, making him one of the better bargain plays this week in FanDuel. T.J. Yeldon, RB, Jacksonville Jaguars ($4,800) – With Leonard Fournette (suspension) set to miss Sunday’s contest against the surging Colts, the Jaguars will deploy a two-headed approach of Carlos Hyde and T.J. Weldon at running back. And while most experts forecast Hyde as the 1A option, I think Yeldon’s versatility and pass-catching prowess plays better against an Indianapolis defense that struggles against pass-catching running backs in a game where the Jags project as a 4.5 point underdog. Stefon Diggs, WR, Minnesota Vikings ($7,700) – When he gets hot, he gets hot. And lemme tell you, Stefon Diggs is en fuego right now. Over his past three games, Diggs has caught 31 of 40 balls for 322 yards and 3 touchdowns, scoring once in each game. The Patriots defense has been playing a little better as of late, but we all know (especially us here in Boston) communication issues in the secondary have plagued the Pats all year. All it takes is one play from Diggs to make your day, but many more could be in store on Sunday. Kenny Golladay, WR, Detroit Lions ($7,300) – With Detroit placing Marvin Jones Jr. (knee) on IR, the Lions wideout corps now consists of Kenny Golladay annnnnnnnnd….Kenny Golladay. Excluding Jones, as well as Golden Tate, whom the Lions traded a few backs, the wide receiver with the next closest targets, receptions, receiving yards, and receiving touchdowns to Golladay’s 84-52-804-5 is Bruce Ellington, with his robust 16-12-80-0 line. Playing from behind against the Rams juggernaut offense, expect Matthew Stafford to pepper his lone threat early and often. Jarvis Landry, WR, Cleveland Browns ($5,500) – This pricing is OUTRAGEOUS! Listen, I understand Jarvis Landry has just 11 receptions for 102 yards the past three weeks, but he still ranks seventh in the NFL in targets with 111. Playing from behind, look for Baker Mayfield to utilize his PPR machine to move the chains. Demaryius Thomas, WR, Houston Texans ($5,300) – With Keke Coutee aggravating his hamstring injury Monday night Week 12, his status for Week 13 is in doubt. No matter. Demaryius Thomas is here to save you. With most of the attention on superstar wide receiver DeAndre Hopkins, DT used his big frame last week to score two red zone touchdowns. In a game with sneaky shootout potential against Cleveland, look for Thomas to once against garner a large amount of looks near the goal line. Eric Ebron, TE, Indianapolis Colts ($5,600) – With the Colts placing Jack Doyle (kidney) on IR, Eric Ebron projects as a weekly top 5 TE play from here on out, with immense upside. Through 11 games this year, Colts tight ends have caught 70 balls on 105 targets for 773 yards and 13 touchdowns. If you take away Doyle’s fumble, their combined 188.3 fantasy points would rank first among all tight ends. Cameron Brate, TE, Tampa Bay Buccaneers ($4,900) – FanDuel just refusing to catch up here. We all know about Jameis Winston and Cameron Brate‘s touchdown connection, and it continued in Brate’s first start this year. The Carolina Panthers allow the most fantasy points to opposing tight ends (they allowed 2 to O.J. Howard in their first meeting with Tampa this season), and with Brate’s price coming in near the bottom of the barrel, he should once against provide good return on your investment. Los Angeles Rams DST ($4,100) – Projecting as 10 point road favorites, the Los Angeles Rams DST should easily handle the sputtering Lions offense. The Rams rank top 5 in takeaways, and the Lions rank bottom third in giveaways, so with Stafford forcing throws more than usual expect on Sunday this ball hawking unit to create big plays on defense. New York Giants DST ($3,300) – With Mitchell Trubisky still nursing a sprained AC joint, the Bears will turn to Chase Daniel Week 13. Although he performed admirably in Detroit on Thanksgiving, he is still Chase Daniel and will have to play in the conditions in New York this Sunday. 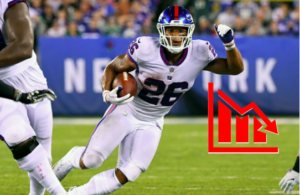 The New York Giants DST usually provides lackluster performances, but I am willing to risk it given the situation…and my Black Friday spending above. And that’s a wrap for Fanduel Week 13 analysis. Remember to always look at the matchups and Vegas totals, which are always telling, and do not be afraid to admit they know more than you, because they usually do. Until next time, good luck and don’t forget to tip me 10% of your earnings. Thanks in advance.